When you try to access, modify, or save a Smart Form, an error occurs when its tries to load the XSLT document. The error appears most often after a server migration, name change, upgrade, and so on, and is often caused by a communications issue on the server with the server unable to resolve its name into its IP address. Some operations, such as reading an XSLT file, require the server to make a request to itself. It the document cannot be loaded, the error results. Note: the SERVER is accessing this URL. 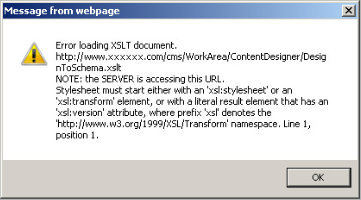 Stylesheet must start either with an 'xsl:stylesheet' or an 'xsl:transform' element, or with a literal result element that has an 'xsl:version' attribute, where prefix 'xsl' denotes the 'http://www.w3.org/1999/XLS/Transform' namespace. Line 1, position 1. If adding the site name and IP of the site does not resolve the issue. Confirm in IIS that the bindings for the site and the settings in the hosts file match. If the bindings are correct, the proper IP and site names are listed in the hosts file, try adding in the localhost IP of 127.0.0.1. For example: 127.0.0.1 localhost . Then, revaluate the behavior. Also, you can try adding the IP and machine name as well as the site name. If the above steps do not work, go to your site's web.config file and search for wspath . This value should be a URL link. Verify that the URL name is the SAME as the name as the site bindings. If not, change the wspath value to match the site binding name. For example if it reads: http://localhost/Workarea/ServerControlWS.asmx and your site name is hostlocal (rather than localhost ), you would it want it to read the following: http://hostlocal/Workarea/ServerControlWS.asmx instead. After these changes are made, re-evaluate the behavior. If none of these steps help resolve the issue, test the behavior on the server vs. off-server, and see if the behavior is the same. This will help Ektron Support to evaluate a possible root cause.